The Python Interactive experience now comes with a built-in variable explorer along with a data viewer, a highly requested feature from our users. Now you can easily view, inspect and filter the variables in your application, including lists, NumPy arrays, pandas data frames, and more! A variables section will now be shown when running code and cells in the Python Interactive window. Once you expand it, you'll see the list of the variables in the current Jupyter session. More variables will show up automatically as they get used in the code. Clicking on each column header will sort the variables in the table. The Data Viewer requires pandas package 0.20 or later, and you will get a message to install or upgrade if it's not available. The Variable Explore is enabled by default. You can turn it off through File > Preferences > Settings and looking for the Python > Data Science: Show Jupyter Variable Explorer setting. We simplified the process of configuring the debugger for your workspace. When you start debugging (through the Debug Panel, F5 or Debug > Start Debugging) and no debug configuration exists, you now will be prompted to create a debug configuration for your application. Creating a debug configuration is accomplished through a set of menus, instead of manually configuring the launch.json file. This release includes several fixes and improvements to the Python Language Server. We added back features that were removed in the 0.2 release: "Rename Symbol", "Go to Definition" and "Find All References", and made improvements to loading time and memory usage when importing scientific libraries such as pandas, Plotly, PyQt5 , especially when running in full Anaconda environments. To opt-in to the Language Server, change the python.jediEnabled setting to false in File > Preferences > User Settings. We are working towards making the language server the default in the next few releases, so if you run into problems, please file an issue on the Python Language Server GitHub page. Be sure to download the Python extension for Visual Studio Code now to try out the above improvements. If you run into any problems, please file an issue on the Python VS Code GitHub page. 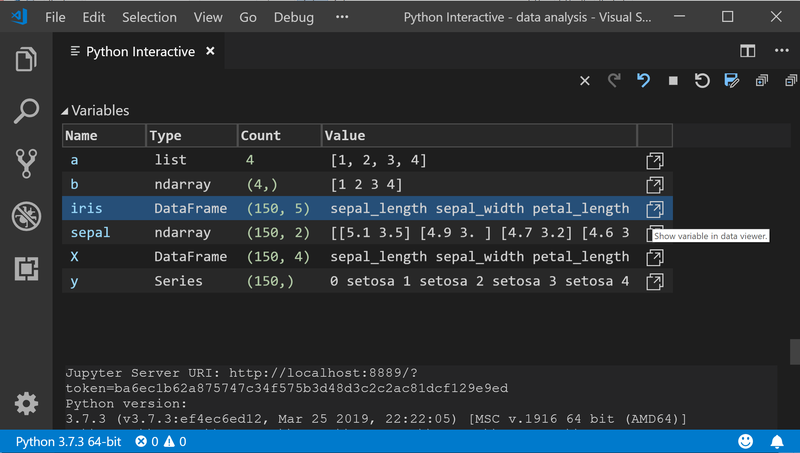 The post Python in Visual Studio Code - April 2019 Release appeared first on Python. Requests is getting a makeover slated for release in 2020: asyncio, HTTP/2, connection pooling, timeouts, Python 3.6+, and more. Step-by-Step Python learning paths and study plans for beginner, intermediate, and advanced Python developers. What do you do when your organization uses Python for in-house development and you can't (or don't want to) make everything Open Source? Where do you store and manage your code? How do you distribute your packages? Stefan lays out his approach in this detailed article. What are the main differences between Django and Flask? What are their respective strengths and weaknesses? Read Damian's article to find out. Learn how to build a Python GUI app for browsing the NASA image library from scratch using the wxPython toolkit. Inside baseball about PEP 570. In this step-by-step tutorial, you'll learn how to work with PDF files in Python. You'll see how to extract metadata from preexisting PDFs . You'll also learn how to merge, split, watermark, and rotate pages in PDFs using Python and PyPDF2. A list of harmful patterns & pitfalls you can avoid in your own Python code. This is an older post but it still applies as of 2019. Worth a read! Indeed prime is a hiring platform exclusively for tech talent like you. If you're accepted, we'll match you with companies and roles that line up with your skills, career goals and salary expectations. Apply for free today. In this course, you'll learn how to send emails using Python. Find out how to send plain-text and HTML messages, add files as attachments, and send personalized emails to multiple people. Later on you'll build a CSV-powered email sending script from scratch. Learn how to get started with your Google Coral TPU Accelerator on Raspberry Pi and Ubuntu. You'll then learn how to perform classification and object detection using Google Coral's USB Accelerator. "We took 300 job specs for Python developers, scraped from StackOverflow, AngelList, LinkedIn, and the websites of some fast-growing tech companies worldwide. From all these descriptions, we extracted the skills which were mentioned most frequently"
This is an infographic comparing commit frequency and other metrics for the most popular data science libraries in Python, R, and Scala. Learn how to use Python's time module to represent dates and times in your application, manage code execution, and measure performance. This was PyCoder's Weekly Issue #365. What skills does a Python dev need in 2019? Here is what a data-driven research shows. This was originally posted as a comment on @fogus's blog post "Why Clojure doesn't need invokedynamic, but it might be nice". I figured it's worth a top-level post here. Ruby on Rails: Rails 3.1.1 has been released! Changing rake db:schema:dump to run :environment as well as :load_config, as running :load_config alone will lead to the dumper being run without including extensions such as those included in foreigner and spatial_adapter. I'm assuming here that :load_config needs to be invoked separately from :environment, as it is elsewhere in the file for db operations, if not the alternative is to go back to "task :dump => :environment do". rake assets:precompile loads the application but does not initialize it. To the app developer, this means configuration add in config/initializers/* will not be executed. Fix assertselectemail to work on multipart and non-multipart emails as the method stopped working correctly in Rails 3.x due to changes in the new mail gem. Add deprecation for the preload_associations method. Fixes #3022. Don't require a DB connection when loading a model that uses setprimarykey. GH #2807. Fix using select() with a habtm association, e.g. Person.friends.select(:name). GH #3030 and #2923. Fix belongs_to polymorphic with custom primary key on target. GH #3104. CollectionProxy#replace should change the DB records rather than just mutating the array. Fixes #3020.
lib/activerecord/connectionadapters/mysql_adapter.rb: LRU cache keys are per process id. Database adapters use a statement pool for limiting the number of open prepared statments on the database. The limit defaults to 1000, but can be adjusted in your database config by changing 'statement_limit'. Ensure we are not comparing a string with a symbol in HasManyAssociation#inverseupdatescounter_cache?. Fixes GH #2755, where a counter cache could be decremented twice as far as it was supposed to be. Plugins developers need to special case their initializers that are meant to be run in the assets group by adding :group => :assets. Ricardo Signes: improving on my little wooden "miniatures"
A few years ago, I wrote about cheap wooden discs as D&D minis, and I've been using them ever since. They do a great job, and cost nearly nothing. For the most part, we've used a few for the PCs, marked with the characters' initials, and the rest for NPCs and enemies, usually marked with numbers. I'm not sure what I'll want next: either I'll want five more of each color or I'll want five more colors. More colors will require that I pick up some white paint, while more of those colors will only require that I re-match the secondary colors when mixing. I think I'll wait to see which I end up wanting during real combats. 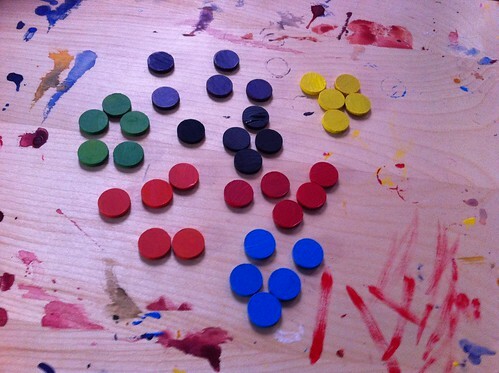 These colored tokens should work together well with my previous post about using a whiteboard for combat overview. Like-type monsters will get one color, and will all get grouped to one slot on initiative. Last night, for example, the two halfling warriors were red and acted in the same initiative slot. The three halfling minions were unpainted, and acted in another, later slot. Only PCs get their own initiative. I think that it did a good amount to speed up combat, and that's even when I totally forgot to bring the combat whiteboard (and the character sheets!) with me. Next time, we'll see how it works when it's all brought together. I won't though. It would just take far too much effort. And, besides, a couple of people have pointed out to be that the real Vogue are rather protective of their brand. So it's not going to happen, I'm afraid. But as a subtle reminder of the ideas behind Perl Vogue I've created some t-shirts containing the article titles from the talk. You can get them from my Spreadshirt shop.